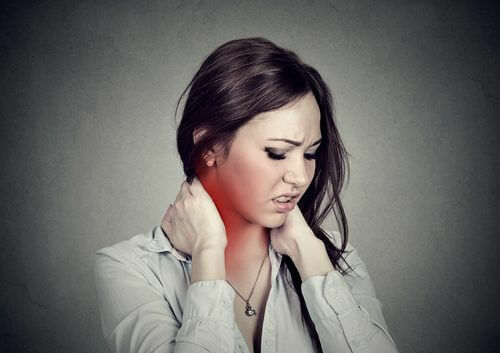 Home » Health » Illnesses » Jaw Pain: Have You Ever Suffered From It? Jaw Pain: Have You Ever Suffered From It? Jaw pain often comes from behaviors that you perform without even realizing it, such as poor posture, stress, or nervousness. Learning to manage these is essential to alleviate this condition. Jaw pain is most commonly caused by anxiety. However, we should also mention that this is a very annoying type of ailment that can happen due to other disorders such as bruxism or even a problem with your joints. If you’ve ever suffered from jaw pain, it probably went away with time. This is especially true if the problem was a result of an emotional trigger like nervousness or stress. 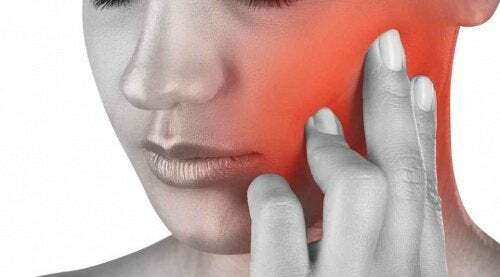 Since it’s a common problem among the population, it’s worth delving a little deeper into the symptoms, causes and remedies for jaw pain. We invite you to pay attention. We should point out that jaw pain can appear in various parts of the face. Some people notice it around one ear more than the other, while others suffer discomfort when they’re eating or talking. This problem is associated with the anatomy of the temporomandibular joint. This joint houses a complex network of nerves and tissues that can become inflamed or suffer from other disorders. Let’s look at them in more detail. Sometimes the pain associated with jaw pain is concentrated around one or both ears. The discomfort can radiate to the upper parts of your face, even to the top of your head. This joint pain will appear especially when you talk, yawn, and eat. Sometimes it can be confused with a simple toothache, but in reality it could be a sign of the erosion of the temporomandibular joint itself. There could be a problem with the joint cartilage disc, or the ligaments and nerves in the region. These are all factors that a specialist will need to evaluate. Remember, however, that bone loss in the joints is something that can occur with age. If you’ve ever felt as if you cannot fully open your jaw, stop and think about how your life has been in the last few days. When you don’t properly manage stress and pressure from your environment, it can generate a “flight” response in your brain, which results in muscle tension, accelerated heart rate, and rigidity in the body that focuses on the areas of the shoulders, neck, and face. 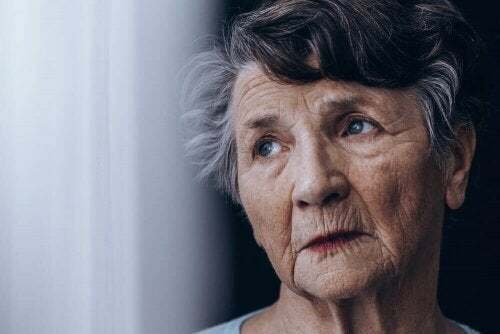 Almost without realizing it, you may be tensing your jaw, grinding your teeth during the night, and experiencing symptoms like ringing in the ears, headaches, and trouble opening or closing your jaw. This problem will disappear with time, but it can be very disabling while it lasts. The origin is usually stress, which you must learn to manage properly. On more than one occasion we’ve talked about jaw pain associated with a behavior that much of the population does at night without realizing it: grinding their teeth. Bruxism can occur due to poor tooth alignment or even night jitters caused by a poor diet, the stress accumulated over the course of the day, or the inability to enjoy restful and relaxing sleep. Bruxism requires proper professionals who can recommend solutions like wearing a mouth guard to sleep. Nevertheless, bruxism is also one of the most common causes of jaw pain. One way to reduce the symptoms associated with temporomandibular disorder (jaw pain) is by taking care of your posture, especially in the region of your shoulder, neck, and head. When you have poor posture, tension in the neck and jaw can appear; in fact, this is something you may not even realize while you’re at work, watching TV, or talking on the phone. Remember to always pay attention to the back/neck axis: they should be in line, straight, and relaxed. In addition, both your lips and teeth should rest together. Your tongue, meanwhile, should rest against your palate while you breathe through your nose. Avoid eating foods that trigger inflammation, such as sugar, fats, excessive amounts of coffee or energy drinks, or preservatives. We know that it’s easy to recommend ways to manage stress properly, but then when you try to carry it out it becomes a labyrinth of walls and difficulty. It’s important to remind yourself that you need to be calm, so that your nerves and blood pressure can care for your health and lead to a long life. Try to find time throughout the day to relax. One good option that always helps take care of the body and mind is to practice yoga. Try implementing these simple tips in your daily life.